This psychological thriller about a missing wife and a sour marriage has been the buzz around the office. I was encouraged to read this novel by a coworker and was hesitant to pick it up, it just did not seem like my type of novel. I enjoy thrillers but a missing wife and a broken marriage? This seemed more like a drama than a psychological thriller but I decided to give it a go. I have never read anything by Gillian Flynn before but I enjoyed her easy going writing style, first person point of view perspective and dark undertones. You truly love to hate the main characters. 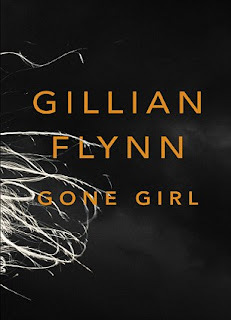 Gone Girl started off predictable and over written when the husband returns home from work on their 5th wedding anniversary only to discover his wife missing, iron on and living room in shambles. His nonchalant attitude towards the disappearance has the detectives narrowing in on him as a suspect. Pretty typical, who done it, husband the main suspect, blah, blah, blah. Half way through the book the plot takes a twist and you are immediately enthralled as to what will be uncovered next and where Gillian Flynn is going to take you.